Discription:A great alternative to your normal everyday beef tacos is turkey tacos. You can forget any store bought taco seasoning fix after you try this recipe because you won’t go back. The meat mixture consists of jalapeño peppers, onions garlic and various spices. 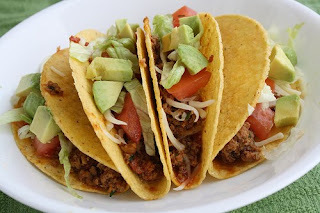 Other ingredients such as chicken broth, canned tomatoes and cilantro are added to the meat mixture as well.This is very easy to make and almost sure to please taco fans. Enjoy. Step 1: In a medium skillet over medium heat add oil, onions, garlic, jalapeno pepper, chili powder, cumin, salt and pepper. Stirring until the vegetables are tender (about 10 minutes). Increase heat to medium-high, add tomatoes and boil for 2 minutes. Add turkey and chicken broth bring to a boil, reduce heat and simmer until the turkey is cooked through and the mixture thickens (about 12 minutes). Step 2: Make up tacos with the various toppings. 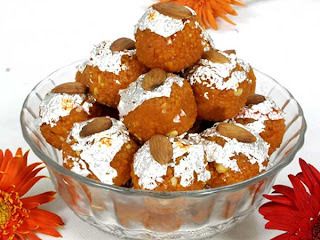 Discription:Motichoor Laddu is thought to be the favorite food of Lord Ganesha. In fact, the sweet also finds a mention in the aarti of lord Ganesha, where a line goes "ladduan ka bhog lage, sant Karen seva". So, when it is occasion of Lord Ganesha's birthday i.e. Ganesh chaturthi, then how one can forget to make the sweetmeat. Motichoor laddus are not very difficult to make and can be prepared in a matter of minutes. In case you need any help in making them, we have also provided the recipe for motichoor laddu in the lines below. When sugar dissolves, add milk. Boil for 5 minutes till scum forms on top. Strain and return to fire. Add color and boil till sticky but no thread has formed. Add cardamom powder and mix. Keep aside. Spread in a large plate. Sprinkle little hot water over it. Cover and keep for 5 minutes. Shape in laddoos with moist palms. Cool and keep open to dry, before storing in containers. Discription:This is another great recipe for buffalo chicken fans. 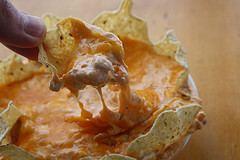 Buffalo chicken dip combines the amazing taste of spicy Buffalo wings with a nice cream cheese oriented dip.This recipe is very simple and only requires mixing and the oven basically does the rest of the work for you. For the hot sauce, you can adjust the amount of heat by the type of hot sauce you get.This is a great recipe for parties and is sure to get eaten up fast. Enjoy. Step 1: Pre-heat the oven to 350 degrees. In a bowl beat cream cheese, ranch dressing and hot sauce until smooth. Fold in chicken. Spray a pie plate with cooking spray and pour the chicken mixture into it. Step 2: Place into the oven and bake at 350 degrees for 15 minutes. Step 3: Remove from the oven and add cheddar cheese on top. Bake for an additional 10-15 minutes. Serve hot. Discription:According to the Wikipedia this is a Meddle Eastern dish. 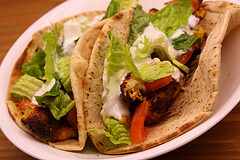 This dish is basically marinated chicken bits served on pitas with tomatoes, lettuce and a delicious yogurt sauce. The chicken gets a lot of its flavor from seasonings such as garlic, cumin and curry powder. The process is very simple. The chicken is first sliced into strips, then marinated and grilled. If you don’t have a grill an indoor grill pan or even the broiler would probably work just fine. Step 1: In a medium bowl combine lemon juice, curry powder, olive oil, salt, cumin, and minced garlic. Add chicken and toss to coat. Let sit at room temperature for 20 minutes. Step 2: To prepare sauce- In a small bowl whisk together yogurt, tahini, lemon juice, and 1 minced garlic clove. Set aside. Step 3: Spray grill grates with cooking spray and Pre-heat the outdoor grill. 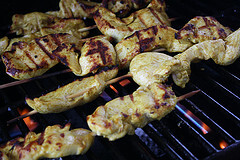 Thread chicken onto skewers and place onto the grill. Grill for 4 minutes on each side or until chicken is fully cooked. 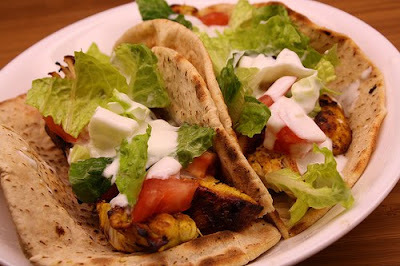 Step 4: Place pitas on the grill rack and grill for 1 minute on each side or until lightly toasted. Place 1 pita on each plate. Top with chicken, lettuce, tomato and add dressing. 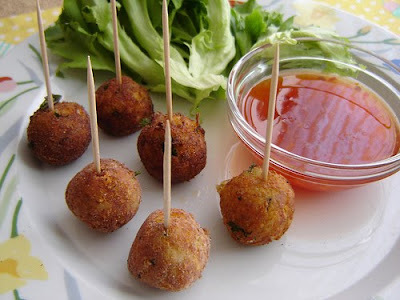 Discription:This is very tasty paneer recipes.Try it and Enjoy!! Next add the crushed tomatoes and tomato paste and cook thoroughly on a medium heat. At this stage add the baby corn and the capsicum and half a cup of water . The baby corn and capsicum should be cooked but there should also be a bit of crunch in them. So don't overcook them. 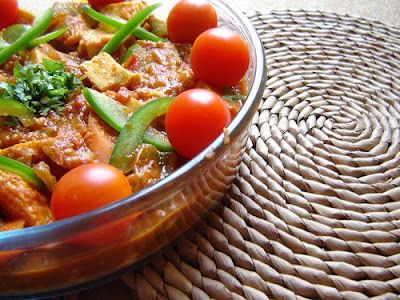 At the last stage add the paneer and give the whole jalfrezi one last boil on medium heat and switch off the gas. 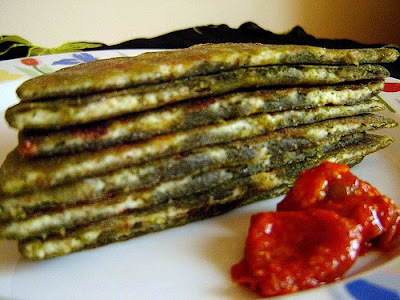 Discription:They are tasty, wholesome ,convenient to carry and a great change from regular chapatis and vegetables or sandwiches.This is tasty paratha .Try it and Enjoy. Now come the chilly powder, turmeric , and pav bhaji masala along with the vegetables. Let the vegetables cook on a low flame. When they are cooked add the salt and ketchup. 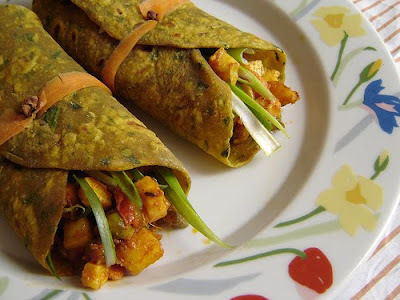 At the last stage add the paneer which does not need any cooking . Mix it all gently together until the paneer is coated with the spices. Give it a taste and adjust seasoning accordingly . Line two greased 9-in. heart-shaped pans with waxed paper and grease the paper; set aside. In a small bowl, combine cocoa and water until smooth; cool. In a large bowl, combine the flour, 1 cup sugar, baking soda and salt. In another bowl, whisk the egg yolks, oil, vanilla and cocoa mixture. Add to dry ingredients; beat until well blended. In a small bowl, beat egg whites and cream of tartar until soft peaks form. Gradually add the remaining sugar, 1 tablespoon at a time, beating until stiff peaks form; fold into chocolate mixture. Bake at 350° for 18-20 minutes or until top springs back when lightly touched. In a large bowl, beat cream until it begins to thicken. Add confectioners' sugar until stiff peaks form; reserving 1-1/2 cups. Spread remaining frosting between layers and over top and sides of cake. Spoon reserved frosting into a pastry bag with a star tip. 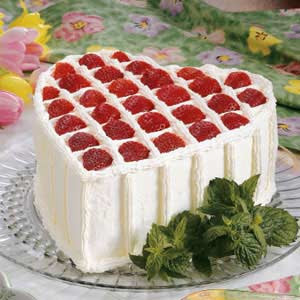 Pipe a decorative lattice design on cake top and sides. Garnish with strawberries and mint if desired. Refrigerate until serving. Yield: 12 servings. Discription:Tomato Rice is a South Indian dish but due to it’s attractive look and the wonderful taste, it has won everyone’s heart. Enjoy this dish with yogurt, pickle and papad…..mmmm! So colorful, simple and easy to make, you’ve just got to give this a try. Wash and soak the rice, use the same method of making Perfect Basmati rice. Once the Rice is cooked and the water drained out, spread it out and allow it to cool. Make the Tomato Chutney as in the recipe. Mix well together, but gently to avoid mashing up the rice. Test for Salt and mix well. 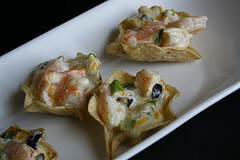 Discription:It’s not too late for another great Super Bowl party recipe, this time it’s Shrimp Nachos. 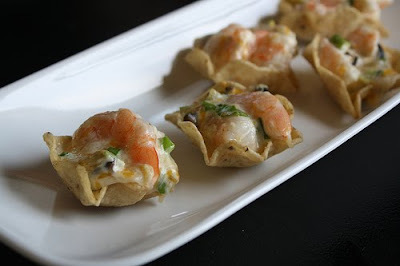 These nachos will make the perfect appetizer for any party or event. What they basically are in a shrimp and mayo mixture inside of tortillas scoops. The nachos’ get most of their flavor from cumin and use a few vegetables such as olives, green onions and green chilies. The best part about this recipe is its super easy. You will have these in the oven within minutes. Step 1: Pre-heat the oven to 350 degrees. In a large bowl combine shrimp, cheese, chilies, onions and black olives. In a separate small bowl combine mayonnaise and cumin. 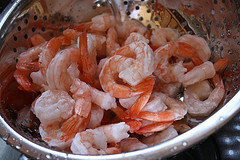 Add to shrimp mixture and toss to coat. Place about 1 tablespoon of the shrimp mixture into each tortilla scoop and lay out in rows on a baking sheet. 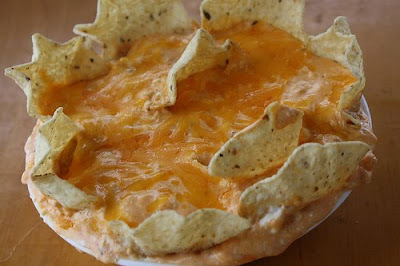 Step 2: Place into the oven and bake at 350 degrees for 5-10 minutes or until cheese has melted. Serve warm. 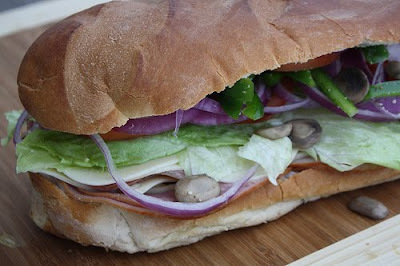 Discription:This is another amazing sub sandwich recipe for your Super Bowl party, perhaps the ultimate sub sandwich!Don’t let the long list of ingredients scare you, most of the vegetables are totally optional and you can add whatever you want. This sandwich is pretty simple; it uses 3 different types of meats, and 3 different types of cheeses. The French bread is spread with garlic butter and then toasted in the oven. Some of the vegetables added include tomato, lettuce, green pepper, onions and mushrooms. This sandwich is massive and will feed about 8 people. Step 1: Pre-heat the oven to 425 degrees. In a small bowl mix together garlic and butter until smooth. Spread the garlic butter onto the split bread halves, sprinkle with parmesan cheese and oregano, and place onto a baking sheet. Bake at 425 degrees until the cheese is lightly golden. Remove from the oven. Step 2: Lay out the bottom half of the French bread and layer with cheeses and meats. Top with lettuce, tomatoes, and olives. Next add onions, mushrooms, green pepper, and banana pepper. Top with the upper layer and press down gently.